Highest Quality Playback using "VMR 9 (renderless)"
Quite a few people use Media Player Classic (MPC) in the "VMR 9 (renderless)" mode. VMR 9 is high quality, with very powerful softsub support, but you have to customize the ffdshow settings to get the best result in this mode. First let's observe what is wrong and what is correct. This is the original frame on the video editor. Our goal is to reproduce the same colors. Now, this is what you'll get by "VMR 9 (renderless)" + ffdshow in the default settings. As you can see, the video is hazy. This is how to use the "VMR 9 (renderless)" mode in MPC. You can choose the resizing method too. Do not use "Nearest neighbor," or you'll get zigzag edges in the full screen mode. Do not use the "...render video in 3D" + "Bicubic" combination either, which is too CPU-intensive even for 3GHz+ Pentium 4 (EDIT (May 18, 2008): This may not be true anymore on a newer computer). I'd recommend the "...render video in 3D" + "Bilinear (PS 2.0)" combination, but this is not a must. The problem is, ffdshow uses the YUY2 color space by default. If YUY2 is disabled, ffdshow uses UYVY, which is not good either. Simply put, they are fast but low quality--especially they don't get along with the "VMR 9 (renderless)" mode. First, force the full-color RGB by unchecking everything but RGB24 and RGB32. 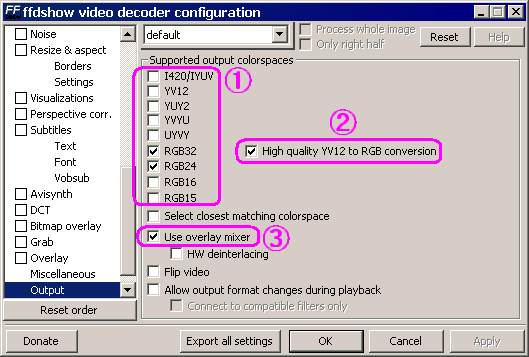 Second, check "High quality YV12 to RGB conversion." 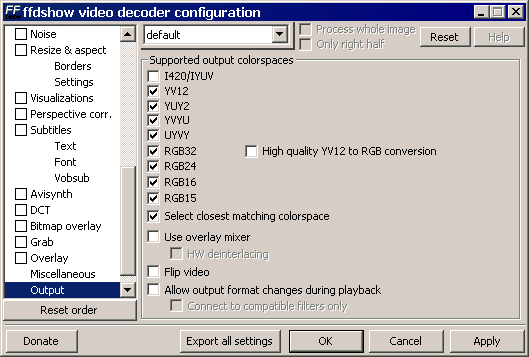 XviD (and DivX too) uses YV12, which we are trying to convert to RGB, and, of cource, high-quality conversion is preferable. If you use the VMR 9 (renderless) mode, make sure you are seeing the correct colors. Last but not least, there is always an option not to use VMR 9. 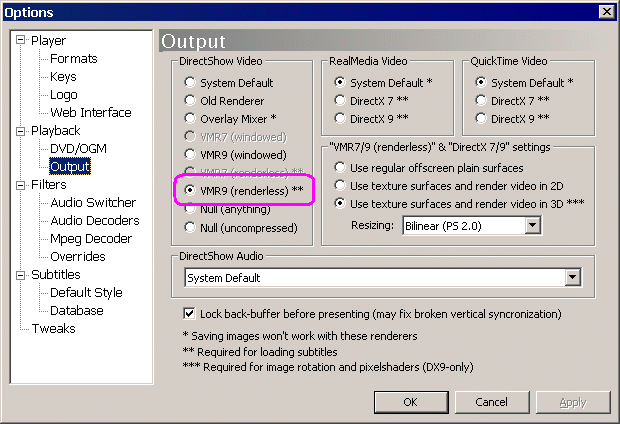 If your hardware doesn't like the "VMR 9 (renderless)" mode, just use another mode, such as "VMR 7 (renderless)" or "Overlay." VMR 9 is known as high-quality, but it doesn't work well in some environments. I hope this guide will help you out.